In the Seattle Japanese Garden as well as throughout our area, Euonymus alatus is an unobtrusive, green-leafed shrub for most of the growing season. Then, in the shorter, cooler days of autumn, its leaves turn brilliant crimson -- and its color rivals that of Japanese maples. This magnificent fall color gives it the common name of burning bush. More than a dozen plants grace our garden – in Areas A, C, E, R, V and W. The largest specimen is located at the southeast tip of Area R, on the orchard’s northeast edge. Euonymus alatus, known as nishiki-gi in Japan (from nishiki, brocade), is a large deciduous shrub that is sometimes referred to as a tree. It grows on wooded hills and low mountains in Japan and Eastern Asia. Plants are densely twiggy, with a horizontal, flat-topped branching habit. They mature at 15 to 20 feet tall, often spreading wider. The Latin word “alatus” means winged, and refers to the flat, corky “wings” that are prominent on young branches – hence its other common names, winged spindle tree and winged euonymus. The wing-like structures develop from a corky material deposited in grooves on the stems in the twigs’ first years. As the twigs age, the wings disappear or become less noticeable. Leaves are oval, 1-3 inches long, and finely toothed. Held opposite on green or brownish stems, they emerge bright green, then turn fiery crimson in autumn. However, the name burning bush is also used to describe a completely different plant. Mentioned in the Bible, it’s thought to be a rare species of rubus, or bramble. Euonymus alatus blooms from spring to early summer with tiny yellowish-green flowers. They are partially obscured by the leaves and generally described as ornamentally “insignificant.” Fruits ripen in fall, when squarish, four-sided capsules split open to display bright red-orange arils. An aril is not a berry, but rather a fleshy or hairy seed coat, usually colorful. The seeds are highly attractive to birds. Burning bush is hardy to Zone 4 (minimum temperature -30 to -20 degrees F.), and it grows well in sun or part shade. In shadier conditions, it is drought-tolerant. Fall color is best, however, on plants growing in full sun, which require regular moisture. It takes well to hard pruning, adapts to air pollution, and tolerates various soil types -- except wet, poorly-drained conditions. The wood was used traditionally in Japan to make toothpicks. All plant parts are poisonous -- but are toxic only when eaten in large quantities. Euonymus alatus was introduced to the US in the mid-19th century as an ornamental plant, but it has since naturalized in at least 21 eastern and mid-western states, where it’s been ruled to be invasive. Birds distribute the seeds. Under favorable conditions, plants become established in woodlands, fields, roadsides and disturbed areas. Forming dense thickets, they out-compete native plants. Burning bush isn’t considered invasive in the Pacific Northwest – and perhaps our dry summers prevent the germination and growth of young seedlings. However, I’ve noticed many seedlings in a family member’s irrigated garden, so even here it may have some potential for invasiveness. Grown primarily for its striking fall color, burning bush also makes an excellent hedge or screen. 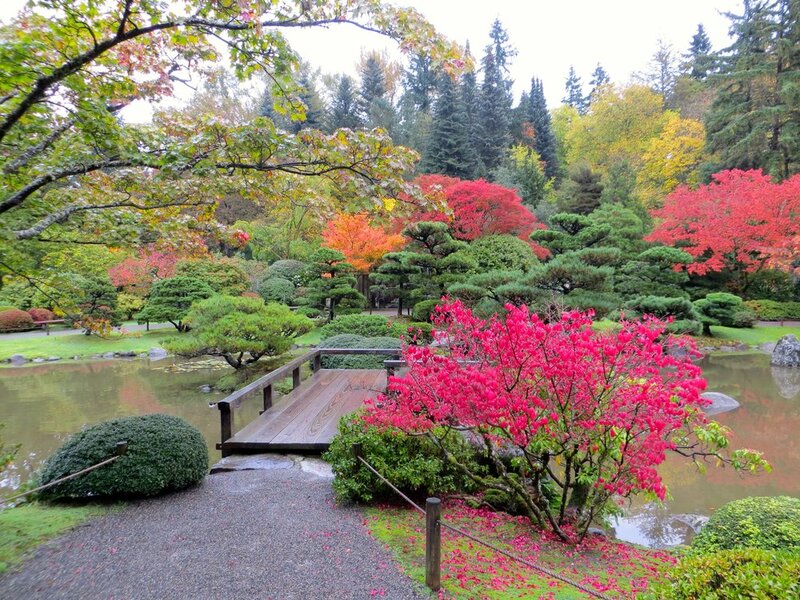 In the Seattle Japanese Garden, it adds diversity and depth to the brilliant display of fall color by our garden’s beloved Japanese maples.